Feedback - What is Feedback ? How can you eliminate feedback ? Feedback as a term is brought in discussion in most of the cases indicating that ringing noise (a screeching noise, a squealing noise, etc etc) that appears sometimes in sound systems. It occurs when a loop is produced between an input (for example: a microphone, a guitar, etc etc) and an audio output (for example: the PA System, the loudspeakers). 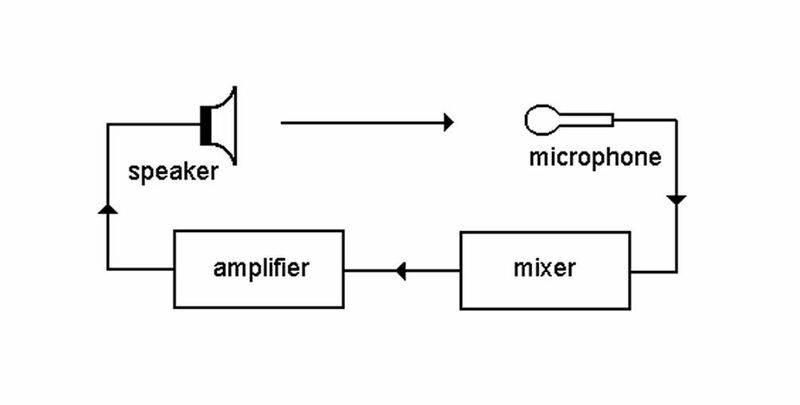 The scheme of a feedback is simple: the microphone captures the sound from the loudspeakers, this sound is amplified further and then it is pushed again in the PA / loudspeakers. There are a lot of variables in “composition” of a feedback such as the frequency response of microphones, the fidelity of amplifiers and also of the loudspeakers, the room’s or venue’s resonant frequencies, the characteristics of microphones such as directional pick-up and also the pattern of the microphones and the loudspeakers and even the distance between these two but as a general rule the feedback will surely appears when the gain in the signal loop will reach the unity gain (0db gain). How can you eliminate feedback ? For the feedback to be eliminated and stopped, you must interrupt the loop which it is produced between the input and the output. There are a lot of possibilities for doing that and you have find the most convenient one in the specific situation you have to deal with feedback. Maybe it will be resolved just with a simple change of the microphone with a more directional one or just changing the position of the mic / the mics or even the position of the loudspeaker. You have to keep the speakers as far as you can placed them from the microphones in order for the output signal to not feed directly into the mic. Sometimes just speaking / singing close to the microphone can make the difference. It is ideal also to turn the microphone off when not in use. The most used solution is equalizing the output signal by lowering that frequencies which are causing the feedback.Using a noise gate or fiter on the input or lowering the output or using in-ear monitoring can also be a good choice. Sometimes you have to avoid aiming loudspeakers directly to reflective surfaces such as walls. was added in our Music Production Glossary Database on October 13, 2016 and it has received till now 171 views. The article tries to bring you an idea of what is "Feedback", or at least, a definition of the term: "Feedback".